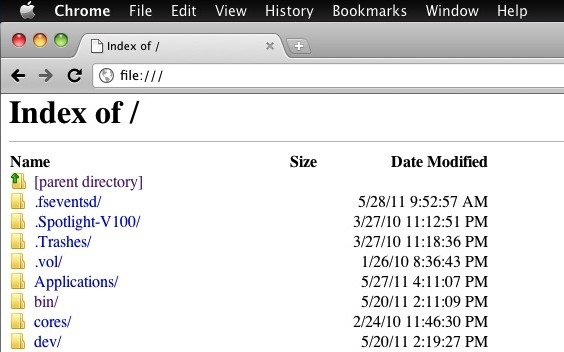 If you don’t want to bother with defaults write commands or the terminal, an alternate method to show hidden files in Mac OS X is to simply use the Chrome web browser. Just hit Command+L and enter / into the address bar (alternatively, you can enter file:/// as the address), and you’ll be presented with the root directory showing all hidden files and folders as well as the typically visible files. Apparently this even works in Windows if you type C:\ into the address bar rather than / which is nice to know. This tip come from Lifehacker and it at least works in the latest Chrome 11 stable builds. If you’re wondering about the screen shot, here’s how to get a black menu bar too. Works in ANY browser on ANY OS — I’ve done it using Firefox and Epiphany on Linux as well. « Kings Quest 1, 2, & 3 are Free to Download for Mac – Blast from the Past!